Homeowners beware: we are coming into what is known as “condensation season”! Condensation is the most common form of dampness found in properties. It can lead to mould, peeling wallpaper and damage to fabrics, including curtains and the clothes hanging in your wardrobe. Damp can also provide a suitable breeding ground for house mites that, along with mould, can aggravate respiratory problems such as asthma. 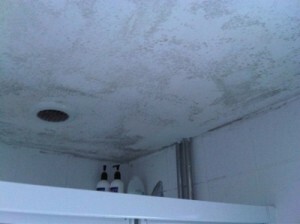 The effects of damp also leave the property cold and smelling distinctly musty. Ultimately condensation can lead to wet rot which, although harmful, can be effectively eradicated if it is caught early on by an experienced specialist surveyor. However, wet rot can soon lead to the more serious condition of dry rot, which is easily one of the most significant, disruptive and expensive predicaments to affect a property. Condensation occurs as a result of improved standards of insulation, double-glazing and draught-proofing. Although these treatments provide better heat retention, the resulting lack of ventilation introduces stale air and encourages moisture. In the kitchen keep the door closed while cooking, ensure lids cover pots of boiling water and use any ventilation means available, such as windows or extractor fans. Around the house and especially in kitchens and bathrooms, keep window trickle ventilators open all year round. Open windows to remove excess humidity for as long as possible (not just for the initial period after cooking, showering or using a tumble dryer). Never dry clothes on radiators. Keep furniture away from close contact with external walls and eliminate general clutter from walls, wardrobes and under beds. All types of property damp issues are potentially destructive and an incorrect diagnosis of rising damp – when it is in fact condensation – can be both expensive and disruptive. We can offer a range of condensation solutions from advice in lowering humidity levels in the home through to recommendation of ventilation products. Should you have any concerns, contact us today for a full property Health Check.